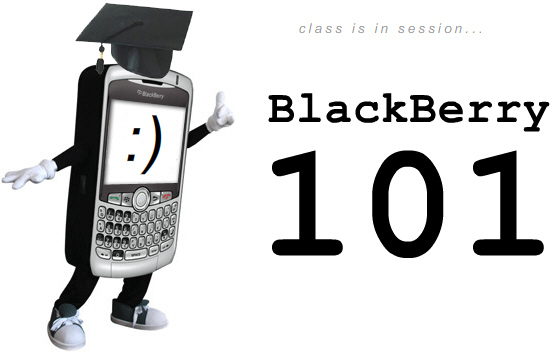 Welcome to a Tuesday evening edition of BlackBerry 101. My apologies - this lecture should be up on the site every Tuesday in the wee hours of the morning but thanks to some server issues class is starting a little late today (teacher was stressed!). Now that we've covered where to find BlackBerry Wallpapers and How You Can Make Your Own, the rest of Lecture 7 covers how to get them off the web and onto your phone! You can Wallpaper A BlackBerry? YES. It's True. You can Wallpaper a BlackBerry. Wallpaper refers to the image on your BlackBerry's Home Screen. I guess you could call it a Home Screen Image, which is actually what RIM refers to it on the BlackBerry device itself, but calling it a wallpaper is just much more fun. What actually is a wallpaper? 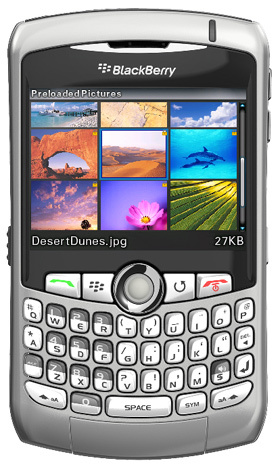 It's simply an image file, formatted to fit your BlackBerry's home screen. 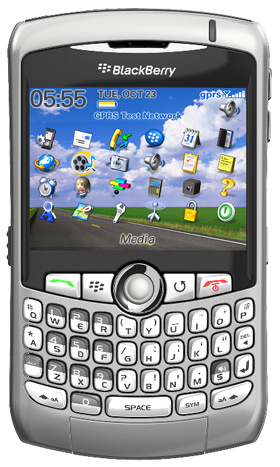 Remember, a Wallpaper is not a BlackBerry Theme, which includes icons, rollover affects, phone screen graphics , etc.. Rather, a wallpaper is part of a theme - it's simply the image that loads behind the icons/shortcuts on your BlackBerry's home screen and can be changed independent of the theme. How Do I get a BlackBerry Wallpaper on my Phone? Email the image (or a link to the image) to your BlackBerry. Download it directly to your BlackBerry by visiting a website from your BlackBerry. 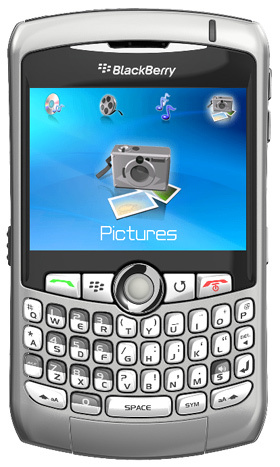 Snap a photo with your BlackBerry's camera, and save image or set as wallpaper. Transfer it over to your BlackBerry via USB (boooo!!!). As you can probably tell, I hate having to connect my BlackBerry handheld to my computer. Afterall, it is a 'wireless' device so for me I like to stay wireless. With CrackBerry.com's Wallpaper Gallery and Wallpaper Maker, both allow you to "Email This Wallpaper" to yourself. 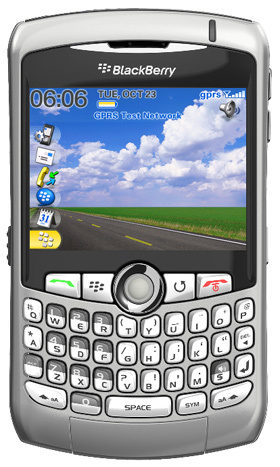 Simply enter the email address that goes to your BlackBerry, and the image will be sent directly to your phone as an attachment to the email. If using the Gallery, you will be sent the URL to the file or both the URL to the file/and the attachment (as you choose). 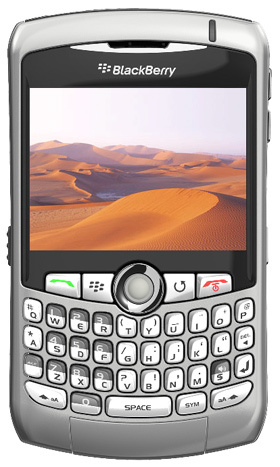 If the wallpaper arrives as an attachment, simply open the attachment (which opens the wallpaper on your BlackBerry's screen). 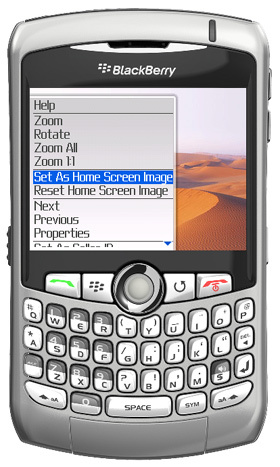 From there, click your BlackBerry menu button and you will have the option to save the image or immediately set the picture as your Home Screen Image. Alternatively, you can click on the URL contained in the body of the email (assuming you found a wallpaper in CrackBerry.com's gallery and used the email option). This will open your berry's web browser which will automatically download/open the image where you can again choose to either save it or set as Home Screen image. This is the same method as if you browse websites directly on your BlackBerry looking for BlackBerry wallpapers. 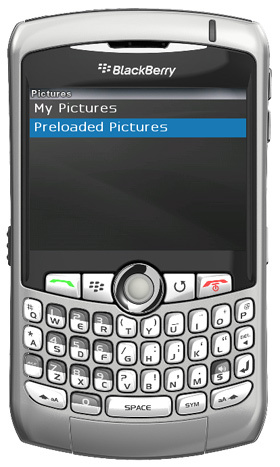 You can also transfer files over to your BlackBerry via USB (again, CrackBerry.com's Wallpaper Gallery makes it easy to download the file to your computer's desktop) using your BlackBerry's Media Manager Software. BlackBerry's Media Manager is going to be a Lecture topic of it's own soon, so I'm not going to get into detail here on this method. For now, use the Over the Air solution! Preview the Wallpaper! Does it look good? Your New BlackBerry Wallpaper is Set! That winds up this lecture. It was an easy one! Last lecture you learned How to Install a Media Card and I said your Homework was to fill up the card and hopefully you have done that. Wallpapering your house is something you might want to do once, twice, or if you're me, then never! When it comes to Wallpapering your BlackBerry, you can do it once, twice, three times, or even 20 x times a day!!! Now get to it!